Hilary John Pullen Burry was the son of Alma Anna Rosa Pullen Burry, a widow, of 53 Beaconsfield Villas, Brighton. Her late husband, Horace John, had run a family marketing garden business with his brother Arthur but died in 1904. Hilary was born in Sompting on 13 January 1895 and was a pupil at Bloxham between September 1910 and December 1911. He was confirmed at school by the Bishop of Oxford in April 1911. He is recorded as having played football at school and having been in Form III. Otherwise, he left little trace in his short time here. Sadly, by the time this was published, Hilary was dead, killed in the battle of Neuve Chapelle on 12th March 1915 at the age of 20. 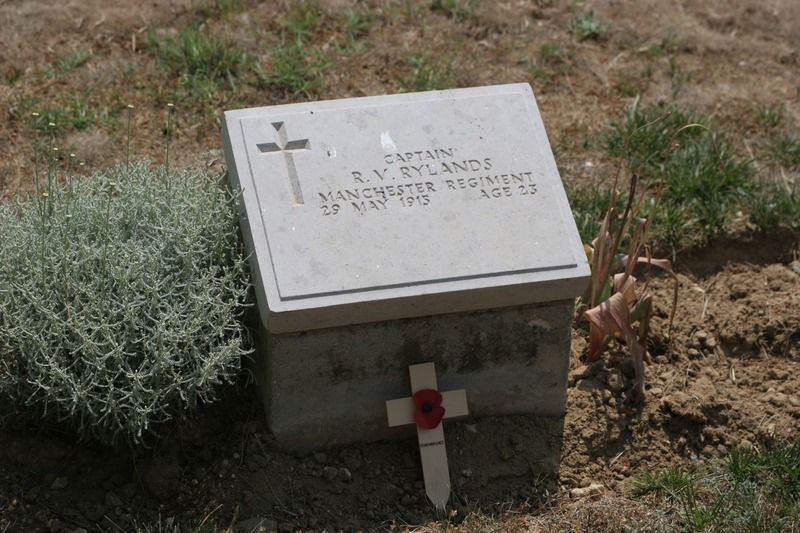 His body has no known grave and he is listed on the Le Touret Memorial near where he fell. On the afternoon of the 12th, the Battalion was in trenches near to the infamous moated farm house located on the Neuve Chappelle battlefield. They had been heavily shelled all day and had been involved in violent combat since day break. The remnants of the 2nd Battalion were ordered to form up with members of Devonshire Regiment, and launch a bayonet attack against the enemy. Hilary’s mother did not inform the school of her son’s death – the loss of her only son may well have been too much for her to bear given the failure of the family business and the death of Hilary’s cousin Cyril at Arras the following year. When the Vicar of Sompting asked for names and details to go on the village War Memorial, Arthur Pullen-Burry replied on a postcard with the briefest details for both the boys, and it was an enquiry in May this year (2013) from Eileen Colwell of the Lancing and Sompting Pastfinders, a local history society, which alerted us to the fact that Hilary was missing from our memorial. After a considerable time of searching, a picture of Hilary was finally found by Simon Batten in May 2017. Local boy Frank Robertson was the second of four sons to Adderbury surgeon James Robertson and his Brazilian wife Lilian. The family originally lived at Hill House in Adderbury. He was born on the 6th May 1894 and the family then moved to 1, Perham Road, West Kensington, London. Frank was born on the 8th May 1894. I have been unable to discover how Frank ended up living in Canada, but he was an engineer by trade. 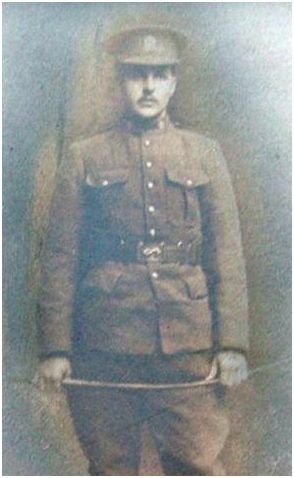 He enlisted into the 5th Manitoba Dragoons on the 24th September 1914, as Private 12616. He was unmarried at the time of his enlistment, and was described as being 5'8" tall, of medium build, with black hair and a significant scar on his left leg below the knee. He left Canada on the 12 October 1914 on the steam ship SS Lapland, arriving in France on the 10th November 1914. In March 1915, the Battalion was in training and on the 14th March Frank was admitted to hospital complaining of feeling extremely unwell. He was diagnosed with cerebro-spinal meningitis and spent the next month in the stationary hospital in St Omer. His medical record forms part of his digitised service records in the Canadian National Archives, and it makes harrowing reading. His descent into an incontinent coma is graphically detailed, and despite the best efforts of the staff of the Royal Army Medical Corps, he died at 7.45am on the 12th April 1916 at the age of 21. After a month of sickness he was unconscious for his last 24 hours and we can only take solace that by that stage his suffering was over. His brother Thomas was killed in 1916 at the Battle of Jutland. Robert Ellis Cunliffe was born in Calcutta, India in 1895 to Agnes and Arthur Cunliffe. He was shown on the 1901 census as living at 14-16 Loscelles Terrace, Eastbourne, in the care of Florence Mellish, whose occupation was listed as "carer of Indian children". Having left the school Cunliffe headed for London where he had a job working as a bank clerk for Parr's Bank, and he resided at 31, Marmosa Road, Honour Oak, South London. He enlisted into the Territorial Army on the 17th June 1913, as Private 1560 the 16th Battalion the County of London Regiment (the School archives state he enlisted into the Queen's Westminsters). He was 5'9" tall and of average build and was declared fit for service in the Infantry despite his extremely poor eyesight. 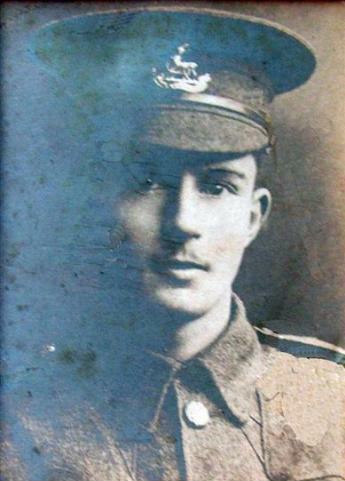 He joined the Army early in 1914 and served initially as a Private in the 1/16th London Regiment. He arrived in France on the 1st November 1914, but sadly I do not know anything of his service with the London Regiment. At some time he was commissioned and was transfered as a 2nd Lieutenant to the Royal Berkshires on the 26th March 1915, in the immediate aftermath of the Battle of Neuve Chapelle. Six weeks after transferring, Cunliffe was in action on the 9th May 1915, in what was to become known as the Battle of Aubers Ridge. This was the British contribution to a combined Franco-British assault against the Germans, hoping to exploit a perceived weakness owing to large numbers of Germans being diverted to the Eastern Front. The plan was for the French to attack across the Douai plain towards Vimy Ridge, with the British attacking to the north of this, near the village of Laventie. The terrain was pancake flat and had poor drainage, exacerbated by the shell fire which raked the area. Their objective was the Aubers Ridge, a slightly raised area of land running for approximately 2 miles from the village of Aubers down to the village of Fromelles. The same ridge had been the scene of disasterous fighting during the Battle of Neuve Chapelle. The Germans had been quick to learn defensive lessons from the fighting at Neuve Chapelle and had been reinforcing and fortifying their trenches. Surrounded by belts of 5 feet thick barbed wire, flanked by concrete emplaced machine guns sited to fire at knee height across No Mans Land, and protected by huge banks of earth, dugouts and concrete bunkers, the German trenches were a formidable obstacle. Sadly the British didn't seem to recognise this, and the intelligence about the strength of the defences wasn't passed on. The artillery barrage which preceded the attack was wholly inefficient and many of the shells were duds. The attack started at 5.40 am when the Royal Berskshires and men from the Rifle Brigade went over the top and advanced on the German lines. In a report written by Captain Charles Nugent, he records that the men were cut down as soon as the left the trenches and took shelter in crops no more than 9" high. He ordered Robert and 2nd Lt Lupscombe over the top to rally the men and continue the advance. Both men duly did as they were ordered and were never seen again. The attack was a disaster and casualties were heavy. The 2nd Battalion lost over 250 men killed, wounded or missing. The bodies of both Robert Cunliffe and Henry Lupscombe were never found. The British suffered over 11,000 casualties in 24 hours, and the offensive was suspended after only one day. "The machine gun and shrapnel fire was very heavy and I am sure there is little doubt that your son was killed that day. Capt Nugent who commanded your sons company last saw him when he started over our own breastwork, and I can find no one who saw him afterwards. He kust have advanced at the head of platoon part of the way to the German trench and been killed there. Your son fell like many other officers of the Brigade gallantly leading his men against the enemy. Only four out of twenty four officers survived." 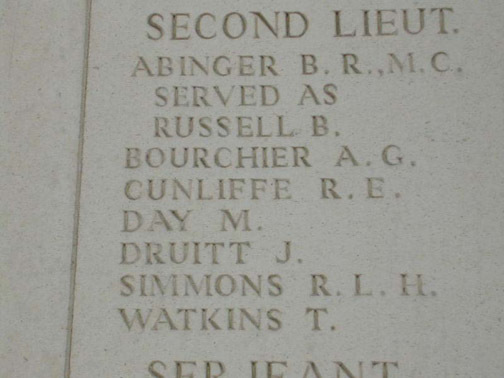 Cunliffe's body was never found and he is commemorated on the Ploegsteert Memorial to the Missing. He was 21 years old when he died. He is commemorated on a memorial in All Souls Church, Eastbourne. Francis Riddle was a local boy, being the second surviving son of the Vicar of Tadmarton the Reverend Arthur Riddle and was born in June 1893. The 1901 census shows Francis living at the address with a half sister Annie and his half brother Gerald. He was a pupil at the school between 1903 and 1911 and appears to have been an excellent sportsman, having won the Sports Championship in both 1910 and 1911. 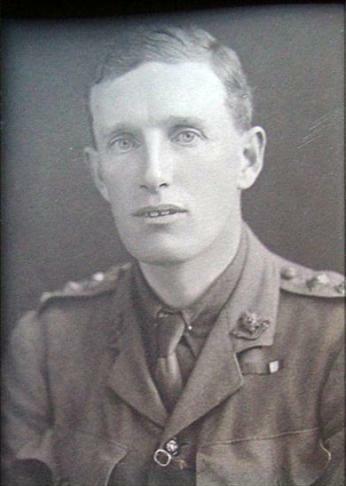 On the 1st July 1913, Riddle was gazetted as a 2nd Lieutenant in the Special Reserve of officers in the The Oxford and Buckinghamshire Light Infantry. He worked much of his time as the Assistant Recruiting Officer for Oxford and on the outbreak of War he was enlisted as a 2nd Lieutenant in the 2nd Battalion OBLI. He went to France in October 1914 and appears to have spent several months working as the Quarter Master for the regiment in Reserve. 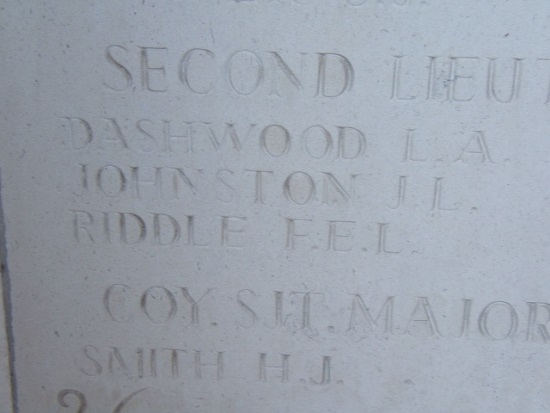 The Battalion went into action on the 15th May 1915 during the Battle of Festubert, and Riddle seems to have been called up as a replacement early on the morning of the 16th May, arriving around 8am. The Battalion went into attack against the heavily defended German lines opposite Richebourg L'Avoué at around 08.45. Riddle was reported as having been killed almost immediately. He died at the age of 21 having been in the trenches for probably less than an hour. He is commemorated on the Le Touret Memorial to the Missing in France and also on the stone war cross in Tadmarton. John Carandini Wilson was the grandson of the opera singer Marie Carandini, who had emigrated to Australia with her parents, where she married Girolamo Carandini, the 10th Marquis of Sarzano, an Italian political refugee and who went on to enjoy an illustrious career as a noted prima donna in the operas of Bellini and Verdi; she sang for many years in Melbourne and Sydney and touredthe United States and New Zealand. She had eight children, and one of themwas the mother of John Carandini Wilson, who was born in Brisbane on 5th January 1883 (another daughter was the grandmother of the distinguished British actor Sir Christopher Lee, who has Carandini as one of his forenames). John Carandini Wilson was a pupil at Bloxham School between September 1896 and April 1898. He is listed on his school record card as the son of Mrs Wilson of 3 Campden Grove, Kensington. He was obviously something of an athlete – he won the Junior 100 yards in 1896 and was the winner of the 1/3 of a mile Jubilee Race held to mark Queen Victoria’s Diamond Jubilee in 1897, every boyin the school entering and being handicapped depending on the year of their birth. He received a silver cup for his victory. He was confirmed in April 1897and gave a recitation at a concert in November of the same year. 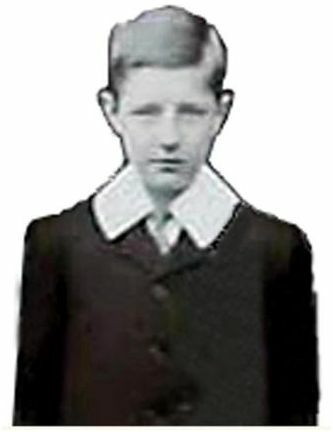 He played for the school’s 2nd XI football team as a 14 year old; the Bloxhamist reported that “Wilson centres well and should be a good outside, but he must stand up to everyone, and go for the ball whether the man is there or not.” He made it into the 1st XI, the following term (March 1898) but left at the end of that term. After he left Bloxham the school lost touch with him - the only mention of him after he left is a reference to him being “probably with the Engineers” in the Bloxhamist for March 1900, even though he was not listed in the Bloxham Roll of Honour for the Boer War. In fact he had joined the Lancashire Fusiliers as a subaltern and fought through the Boer War with his regiment, but when the war ended he resigned his commission to take up wheat-growing in the Canadian north-west. This wheat-growing venture did not prosper, and aftertrying other means of earning a living, both in Canada and the United States,he became a journalist in Los Angeles, working on the Los Angeles Times. Returning to his homeland, John wrote articles and theatre criticism for the Sydney Mail before becoming the military correspondent and dramatic criticfor the Sunday Times in Sydney. 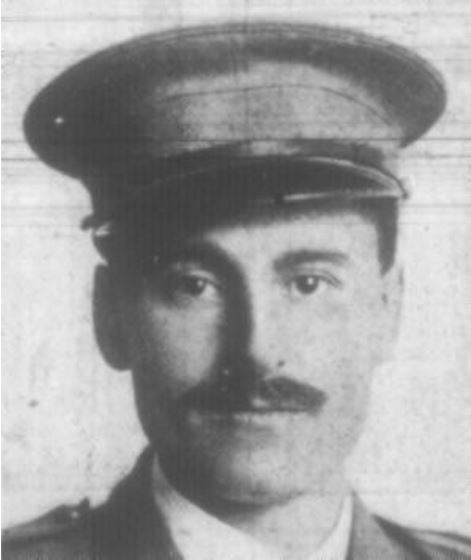 After training in Egypt Wilson – now a Captain – sailed with his Battalion for Gallipoli and took part in the landing at Anzac Cove on 25 April1915, his battalion coming ashore in the 2nd and 3rd waves. He was severely wounded and died from his wounds in Egypt on 21st May 1915. He is buried in the Military Cemetery at Alexandria. Harry Ayres was born on the 7th July 1897, the second son of Solomon “Gaffer” Ayres and his wife Emma, who lived with their four children in a cottage in Queen’s Square in Bloxham. Solomon worked at Bloxham School for many years and was the captain of the village Fire Brigade. Their other son Wilfred married Annie Elizabeth Gascoigne Morgan and they also had two daughters, Ada and Amy. It is believed that in August 1914 Harry was in service as a footman at Shipton Court, a country house at Shipton under Wychwood whose owner Frederick Pepper was a local magistrate, serving as High Sheriff of Oxfordshire in 1910; when all the male employees were dismissed at the outbreak of war and told to enlist, Harry joined the local regiment, the Ox and Bucks Light Infantry, without his parents’ permission. They were horrified but decided to let him go. 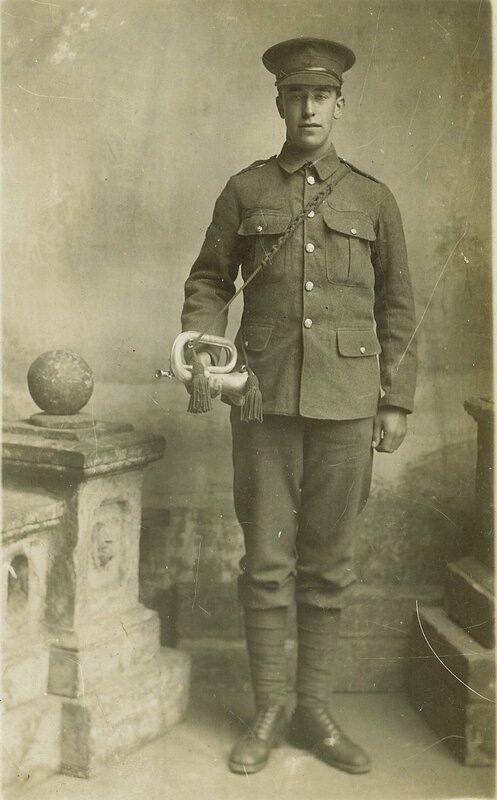 The poignant photograph of Harry in his new uniform shows a proud young man with his bugle but no regimental insignia on his cap. Harry was sent to France with the 5th Battalion of the Ox and Bucks on 5th May 1915. It had long been accepted by the family that Harry had been wounded early July 1917, but detailed examination of the Battalion War Diary make this appear unlikely. There are no casualties recorded during the period 1st July to the 7th July. However, the week before the Battalion had been in action on the 23/24th June launching a number of attacks against a formidable German strongpoint, just outside Railway Wood in Belgium. The casualty count for these actions was horrific and it seems likely that Harry was severely wounded during these actions. Harry’s mother Emma visited him in hospital in France and was horrified by the conditions she found there. Thanks to her insistence, Harry was brought back to England where he died on the 7th July 1915, his eighteenth birthday – the Bloxham School magazine The Bloxhamist states that he passed away in Norwich Hospital but family tradition has it that he passed away at Netley Hospital near Southampton, which appears more likely. His death cast a shadow over the family, and Amy’s granddaughter Joy Tilley recalls that neither her grandmother nor her mother could talk about it without becoming upset. Harry’s older brother Wilfred was forbidden to join up, and he followed his parents’ wishes despite the enormous pressures doubtless brought on him. 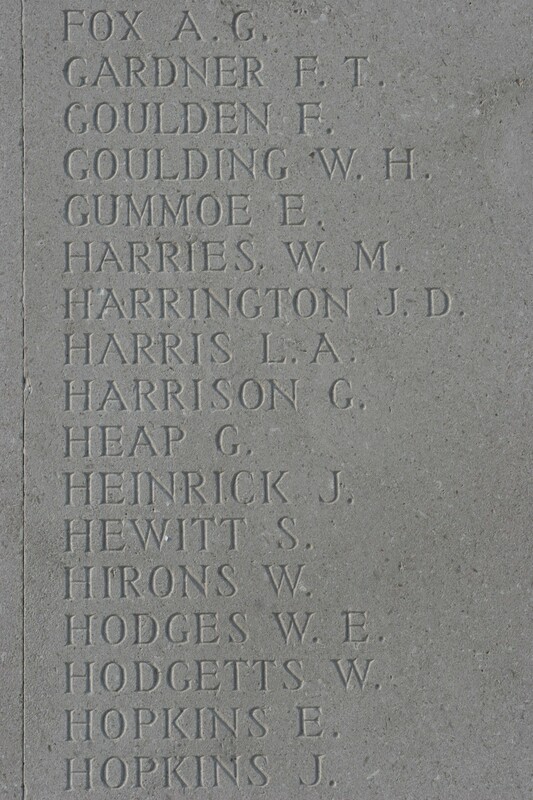 Harry was buried in the Bloxham Churchyard on 12th July 1915 with the school’s OTC providing a firing party and buglers. The Bloxhamist for that month commented that “we should be lacking in generosity if we failed to express our sympathy with Mr and Mrs Solomon Ayres and their family in their present bereavement.” Solomon Ayres continued to work at the school, dying in 1936 at the age of 73. His wife passed away in 1943 in her 83rdyear. She is buried in the same grave as her husband and their beloved youngest son. The wooden cross made for his grave in 1915 still marks the grave alongside an impressive headstone. A tragic story but one all too typical of the experience of so many families in the Great War, and there the story would have ended, at least as far as Bloxham School was concerned, if not for a request for information from two authors of a forthcoming book on the Public Schools and the Great War. I was asked whether I knew of any school servants who had perished in the war, and I had to admit that I did not, but the question spurred me into research which led to a reference in The Bloxhamist for July 1915 suggesting that Harry must have worked for a time at the school alongside his father (“Harry, who a short time ago was also a servant at the School….”), probably working as a serving boy in the dining hall. Reginald Victor Rylands was the eldest son of Richard Rylands and his wife Mary, and was born in Stockport, Manchester on the 9th December 1892. 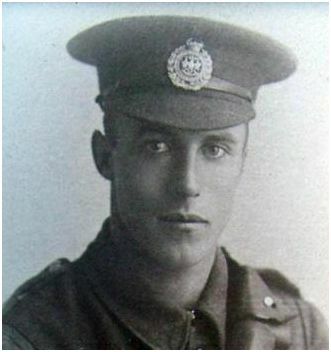 He had a younger brother Harold Bertram who was also a pupil at Bloxham and was killed on the Somme in 1916. He was a pupil at the school between 1902 and 1906. On leaving Bloxham his education was completed at Shrewsbury school. He left Shrewsbury before spending some time in Germany, and then at Manchester University where he studied law, joining his father's law firm Mssr's Boote, Edgar, Grace and Rylands. His father was a senior lawyer and was a Solicitor of the Supreme Court in Manchester. 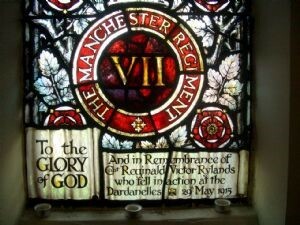 The military was a large part of Rylands life, and he served as an officer in the Territorial Force of the Manchester Regiment, becoming a 2nd Lt in May 1910, a Lieutenant in 1912 and being appointed Captain and Company Commander of the 1/7th Batt Manchester Regiment (TF) in September 1914. He served some time at the start of the War in Egypt where he was commanding the massively important railway junction at Atbara. The Battalion also served in Sudan, before taking part in the fighting at Gallipoli in May 1915. The Battalion landed at V Beach (site of the famous beaching of the River Clyde) and progressed in land. This area was dominated by high cliffs to the north and the fort at Kilitbatir to the south. The battalion was not involved in any major actions during this time, rather it was involved in the peice meal skirmishes that characterised this theatre of war. He was killed on the night of the 29th May 1915, leading an attack against the Turkish lines. "On the night of the 28-29 May B and D Companies were ordered to advance and dig ourselves in about 200 yards in front of the enemy. We crept to within about 200 yards of the enemy when suddenly the moon came out, which was not to our advantage.. Your son was on the extreme left of our advance, commanding half the company when news came through that he had been hit in the shoulder. A sergeant went to him and gave him water, but the bullet must have hit something vital and he passed away within 5 minutes." Attempts were made to retrieve his body, but his body remained lying in No Mans Land for three days until the enemy had been controlled enough to allow safe retrieval. Several men were killed whilst trying to recover him. He was eventually buried just behind the lines with a cross made from a sniper shattered trench perescope. 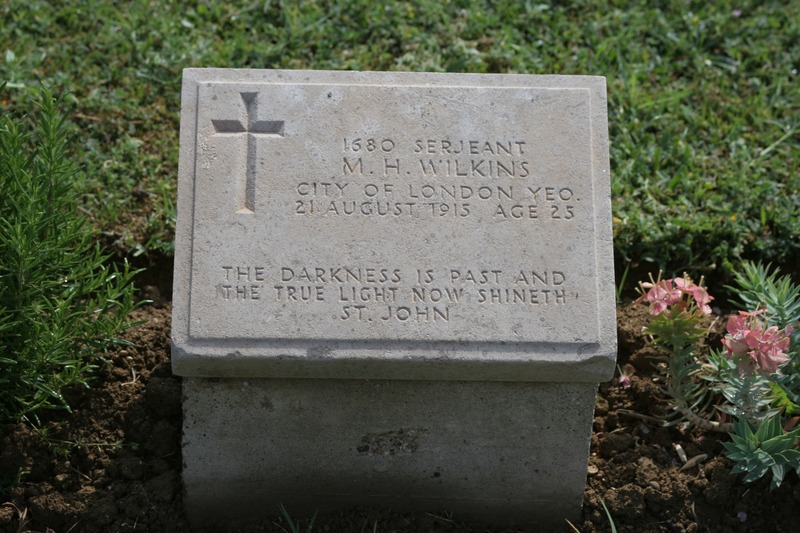 He is buried in Redoubt Cemetery, Gallipoli, and was 23 when he died. Lionel Harris was born in 1896 in Newbury and was the son of Ernest and Marion Harris. His father was an Ironmonger by trade, and Lionel was the middle of three sons. His older brother Alan was also an ironmonger and he had a younger brother Paul. The family lived at 31, Mount Pleasant in the small village of Cold Ash. Despite extensive efforts I have been unable to find any information about his military service, other than he was a Private in the 9th Battalion the Royal Warwickshire Regiment. His medal index card and service record are missing, I have however through researching the Battalion diary been able to ascertain the movements of the Battalion around the time of his death, and as a result we can probably make an assumption as to the action in which he was wounded and subsequently lost his life. The 9th Battalion left the UK on the morning of the 17th June 1915 and headed by ship for the island of Lemnos. They were to be thrown into the Gallipoli campaign just 4 days after arriving in Lemnos when they landed on V Beach in the shadow of the beached freighter the River Clyde. They spent the next two weeks in and out of the trenches, before returning to Lemnos on the 29th July. They returned to Gallipoli and landed at Anzac Cove on the morning of the 4th August. On the 5th they were involved in the heavy fighting towards the dominating ridge of Sari Bair. A spur ran below the crest of Sari Bair which was known as Rhodedendron Ridge and it was here that A Coy of the 9th Royal Warwicks were heavily involved. For four days they attacked and defended, in appallingly hot conditions. They were raked by shell and sniper fire. During these four days, the casualties mounted and by the time they pulled back on the night of the 9th, there was not a single officer left and only 248 men. They lost 15 officers killed, wounded or missing, and of the other ranks, 57 were killed, 227 wounded and 115 missing. It seems likely that Lionel was one of 115, as his body was never found and he is commemorated on the Helles Memorial. When I visited the memorial it was in the process of being renovated and by an amazing stroke of luck, the panel with his name on was one of only 5 which was photographable. Morris Wilkins was born in Ravenshead, Kent the 4th child to Edward and Ellen Wilkins. His father was an Insurance Broker and he had three older sisters Mary, Dorothy and Cecily, and a younger brother Leopold. The family lived at 46 Sydenham Road, Croydon. The 1911 census showed them living at 17 Edith Grove, Chelsea at the home of Emily Shephard, a vocalist. Curiously, Mary's occupation was listed as "poultry expert". Morris was a pupil at the school between 1904-1906 but I have been unable to find out what he did on leaving the school, other than he was working in London. He appears to have been of some means as he played Polo at the Blackheath Polo Club, he also played rugby for Rosslyn Park. Around 1911 he joined the City of London Yeomanry Rough Riders, the 1/1st London Yeomanry, formed in 1901. The Yeomanry served with distinction during the War from 1914 through to 1918. In the Gallipoli campaign the Yeomanry were forced to abandon their precious horses and fight on foot as infantry soldiers. On the 21st August 1915, the dismounted cavalrymen found themselves launched into the attack at the Battle of Scimitar Hill. The battle did not go well for the British and the 2nd Mounted Division were called into battle at around 5pm. Marching inland from Suvla across the dry bed of a salt lake, the advance was soon cut down by accurate and prolonged machine gun fire as it approached Anafarta and Green Hill. 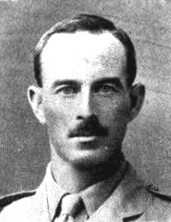 The British lost 5300 men on the 21st August including Morris Wilkins, who was wounded near to Hill 70 and died of his wounds. 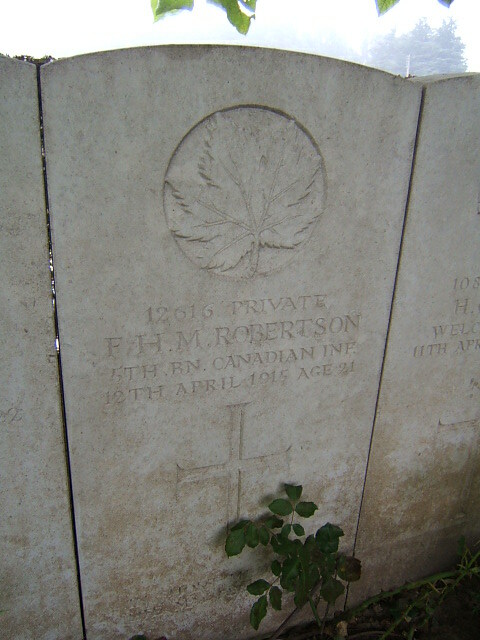 He is buried in Green Hill Cemetery, Gallipoli. He was 25 years old. Charles Archibald Walter Quiney was born on the 20th December 1871, the first of three sons to Charles Baker and Mary Ann Quiney, and was shown as residing at 66, Loughborough Park, Brixton. He was a pupil at the school between 1882 and 1884. I have been able to find out very little about Quiney, other than he worked in the Canary Islands and at the outbreak of war enlisted into the 17th Battalion The Lancashire Regiment, before transferring to the Royal Irish Rilfes. According to the Battalion war diary, the 2nd RIR were in trenches around the area of Bellewaarde Ridge near Hooge in Belgium, and were engaged in what was described as "ordinary trench warfare". 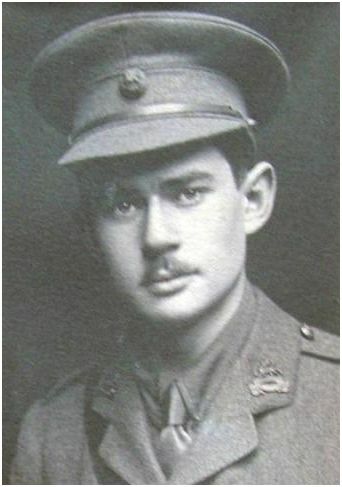 At some point during this time, Quiney was wounded and died in hospital on the 13th September 1915 at the age of 43. 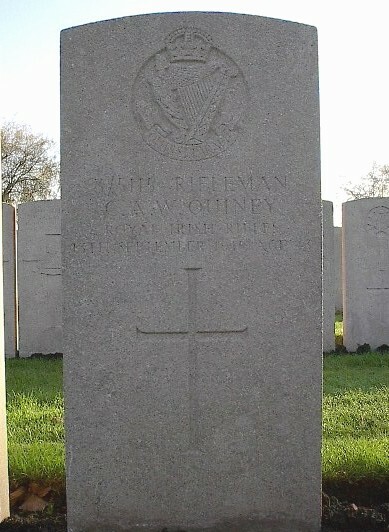 He is buried in Lijssenhoek cemetery. 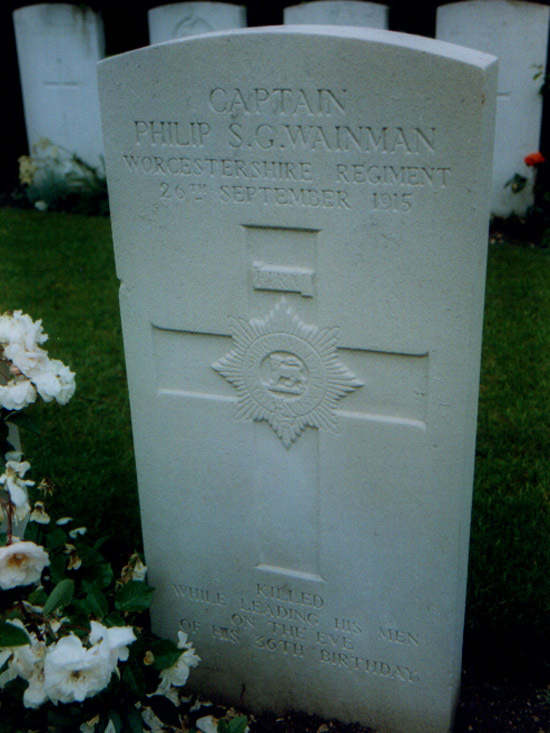 Phillip Wainman was born on the 27th September 1879, in St Helier, Jersey the only son of Lt (Ret) Gordon Wainman and Evelyn. The 1881 census shows them resident in St Helier, by the 1891 census shows them living at 56 Thorne Road, Doncaster, with his fathers profession listed as Local Drawing Inspector. By the time the family were living in Doncaster, Phillip had a sister Gladys born around 1889. 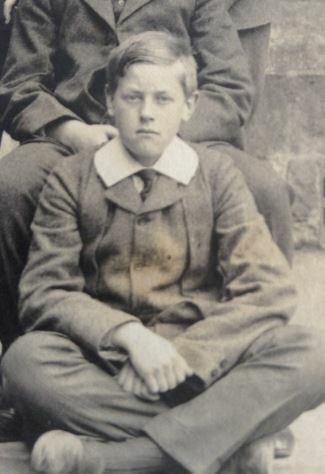 Phillip was a pupil at the school between 1891-1892 before leaving and heading for Fettes College in Edinburgh. He entered the Royal Military Academy at Sandhurst and was commissioned as a 2nd Lieutnenant to the 1st Battalion The Worcestershire Regiment, and rapidly rose to the rank of Captain by 1902. 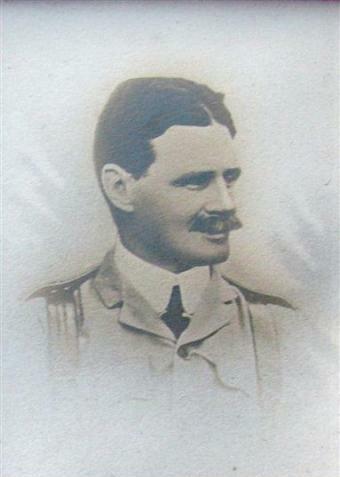 He served with distinction during the South African War, winning the Queens Medal with clasps for action at Kwa Zulu Natal and Bloemfontein, and on his return to the UK he was promoted to Adjutant of the 1st Devonshires in 1906. He appears to have been a man of some reputation. He married Miss Christine Ledlie Wheeler of Philedelphia, with the wedding being reported in the society pages of the New York Times. On his return to the UK the couple lived at the magnificent stately home Otterington Hall, in North Yorkshire. He was by all accounts a splendid sportsman and horseman, playing Polo and hunting, as well as being an excellent shot. At the outbreak of war, he immediately gained his commission back in his original regiment and served with them throughout the opening stages of the War. He was mentionned in dispatches for displaying "gallant and distinguished services in the field". By September 1915, the 2nd Worcesters found themselves in the trenches of Northern France, near the industrial wasteland of coal fields and slag heaps around the small mining town of Loos. The battle of Loos came on the back of the disasterous offensives at Neuve Chappelle and Festubert earlier in 1915. On the 26th September, the eve of his 36th birthday, Wainman led his men in an advance on the German lines near the heavily fortified quarries at St Eloi. From the very outset of the day, the Battalion was beset by problems. Poor communication on the morning of the 26th delayed the starting off. The order was received that the Battalion was to form up in a location which was actually some 200 metres behind the existing German front line. This naturally led to much confusion whilst the navigational issues were resolved. Once some of these difficulties were summounted the Battalion made its way through communication trenches at approximately 1pm. They were carrying large quantities of bombs in wooden boxes which made progress through the trenches difficult. The over crowded lines, coupled with unwieldly boxes created a bottle neck. Just when things couldn't get any worse, panic set in as a gas cylinder, to be used in the attack began to leak and filled the British lines with poison gas, with many men becoming casualties. At about 4pm the Battalion attacked across pancake flat fields. In company with the 9th Norfolks many men managed to reach the German front line, and as soon as they did so, the Germans appeared from their second line and unleashed hell on the Worcesters. Pinned down in front of the old German front line, they were enfiladed with machine gun fire from three sides, and were peppered with morter and rifle grenade fire. A second wind saw the man advance until they came across a half dug German trench where they took what little cover there was. Using their entrenhing tools or in some cases their bare hands, men tried to dig in to the solid ground, all the time being fired on by machine guns and rifle fire. As darkness fell the order came through for a suicidal bombing raid to be done against a German second line communication trench - this attack was unsuccessful. Casualties were massive and as night fell, a roll call was done. 13 officers had been killed or wounded including the second in command, all company commanders, the Medical Officer, the Bombing Officer, 3 out of 4 Company Sergeant Majors, and over 300 other ranks had been killed or wounded. He is commemorated on the War Memorial at Worcester Cathedral. Wainman's sword was sold at auction at Sotheby's in 2011, sadly I was pipped at the post for it. Cyril Jackson was born in December 1879 in the Potteries town of Hanley, one of 8 children to the Reverend Charles Bird Jackson and Mary Jackson. He had three older brothers, three older sisters and a younger sister, all of whom were born in Hanley. The family moved to Wold Newton in Lincolnshire and Charles was sent to various boarding schools, including Queen Elizabeth School in Horncastle and then Newark and finally Bloxham. Mr Jackson is the Rector of Wold Newton. He requires his parishioners make obeisance to him. A Sunday or two ago, Mr Jackson passed some boys at the rectory gate. One of them, he insists, did not bow to him. He has, therefore, been excluded from the school until he apologised. The school is a public elementary one, receiving a Government grant. It would be well that this divine should be told that it is no sin in a parishioner not to take off his cap to him, and that, in any case, this heinous offence cannot be punished by exclusion from a public school receiving a Government grant. 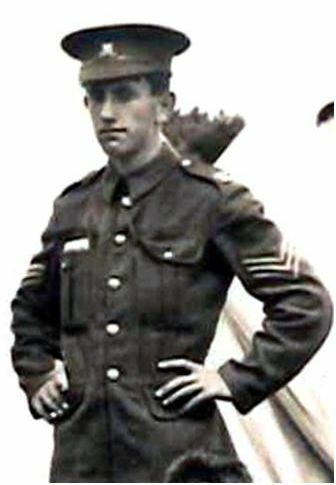 Unlike his brothers who had all pursued careers in either Medicine or Law, Cyril enlisted into the Army and was commissioned as a 2nd Lieutenant into the Border Regiment. In 1889, he was stationed in Malta with the 2nd Border Regiment. In February 1890, he sailed from Malta on HMS Malabarbound for his posting at Chakrata in India. This initial stay in India didn’t last long, however, as he contracted a 'fever' and had to return to England on sick leave. After convalescing, he returned to India in March 1891. In 1892, Cyril was attached to the 27th Madras Native Infantry in the Indian Army based at Mahidpoor in Lucknow. He transferred to the Indian Army in April 1893 and was posted to the Bhopal Battalion, in Sahore, Bhopal. On 9 March 1899, Cyril, the 31-year-old officer, married Beatrix Clara Grey at St Thomas Church in Calcutta. 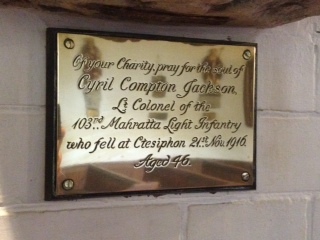 Cyril Compton Jackson next saw service in Afghanistan and Kashmir before being stationed in Allahabad for several years as adjutant to the local levies. In 1914, Cyril was given the command of the 103rd Maharatta Light Infantry and formed part of D Force in the Mesopotamian Campaign. He was subsequently given charge of the 110th Light Infantry. In November 1915, the regiment was in action in Mesopotamia, and involved in fighting near Baghdad in what would become known as the Battle of Ctesiphon. According to one account, a shell landed on a tent during an orders meeting and killed several senior officers, although other accounts imply that he died after being hit by fire from Turkish machine guns. 'I shall always remember this march as I rode with Colonel Jackson of the 110th Maharatas, and one of the best, who with his wife used to drive out from 'Nagar to my dam on Sundays. 'The colonel was one of the few who took an interest in the country and its prospects, and being a first class artist himself, spent all his spare time sketching. 'As we rode along he spoke eagerly of the Arch and other ancient monuments we hoped shortly to see and how pleasant a rambling tour around Baghdad would be, little realising that within three days he would be lying dead on the field of Ctesiphon. He is commemorated on the Basra War Memorial, Iraq and the parish memorial in Wold Newton. There is a brass plaque in the church at Wold Newton in his memory. He was 46 years old when he died. Henry Ball Holmes was born in Hong Kong on the 23rd July 1873, to Henry and Jane Holmes. Henry was a solicitor and his wife was a Doctor. Henry attended the school between 1885-1887 and on leaving he went to the Royal Military Academy. He was a member of the Irish Horse, part of the militia and was gazetted as a 2nd Lieutenant into the Royal Irish Fusiliers on the 2nd June 1894, being promoted to Lieutenant in 1897, Captain in 1902 and Major in 1913. 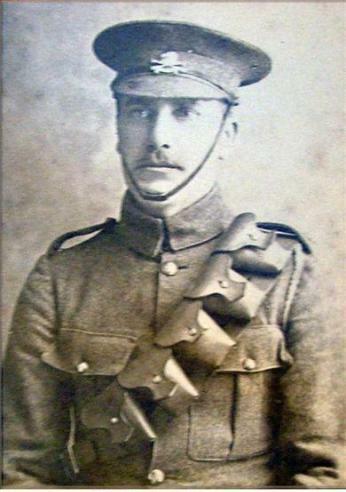 Holmes served with distinction througout the South African War, and was mentionned in despatches in 1902. He saw action all over South Africa, through Natal, Transvaal, Lombards Kop and the Zululand front in 1901. He was for a time O.C of the rest camp at Machadadorp. In 1911, Holmes was serving in India with the regiment when the newly crowned King George V and his wife Queen Mary, attended for a royal visit. Holmes, who was at time serving with the 2nd Battalion was appointed equerry to the King for the duration of his visit on the Royal Train and at the Delhi Durbar. The Delhi Durbar was a mass gathering held to mark the coronation of a British King or Queen during the time of empire. In appreciation of this service the King presented him with a diamond encrusted monogrammed stick pin, which is held in the regimental museum. The 2nd Battalion Royal Irish Fusiliers marched from their barracks at Winchester on 19th December 1914 to the docks at Southampton where they boarded the SS City of Benares. The following day they landed at Le Harve. Major Holmes took part in numerous engagements with the Battalion until 20th April 1915 when he was shot through the face by a sniper whilst the Battalion were located at Bellewarde Farm, during the second battle of Ypres. He was carried to an aid station, and was then transferred to Luddon Camp, Buncrana where he died of septic blood poisoning of the brain. 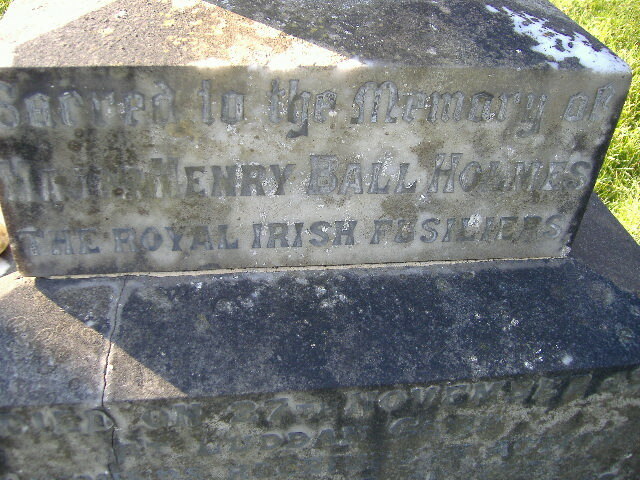 He was later buried at Lower Fahan churchyard in County Donegal and a memorial was erected to him, by the regiment. A fellow officer wrote about him " All the regiment past and present mourn with you; he was a perfect gentleman, a gallant soldier and a dear friend to all." He married Mabel Violet Ryles on the 2nd December 1914, and had a posthumous still-born son, born on the 20th February 1916.